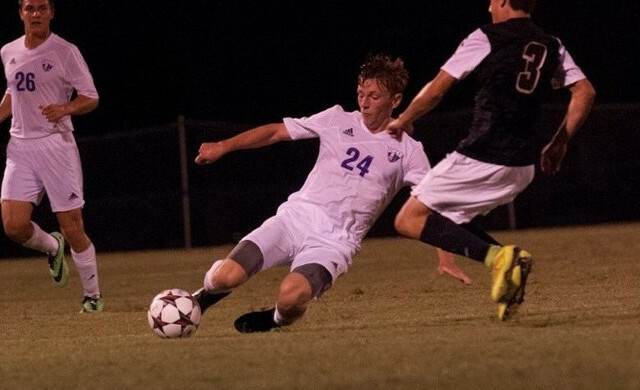 TYLER – The University of Mary Hardin-Baylor men’s soccer team beat the University of Texas at Tyler 2-0 Friday night in Tyler. The win improves the Cru to 6-6-2 overall and 3-2-2 in American Southwest Conference action while the Patriots fell to 7-4-4 overall and 3-3-2 in conference play. Ben Hammonds was the first Crusader to score, converting a penalty kick in the 25th minute for the 1-0 lead. Julio Mar struck quickly after that for the Cru, scoring again 57 seconds later off an assist from John Williams. UMHB fought off a strong offensive surge from the Patriots, fighting off 12 shots in the second half to secure the 2-0 win. Hammonds and Mar led the Cru with three shots each while Case Carnes added two. UMHB totaled 11 shots while the Patriots put up 20. Blake Lander earned the win in the goal for the Cru, allowing no goals and making seven saves. John McGuffin took the loss for U.T.-Tyler, making one save and allowing two goals. UMHB returns to action Friday, October 31st in a 3 p.m. match against University of the Ozarks at the Cru Sports Plex in Belton.